This area of town is located sort of beside Kimihurura on the side of the same hill on the other side of the Convention Centre. If that makes sense. 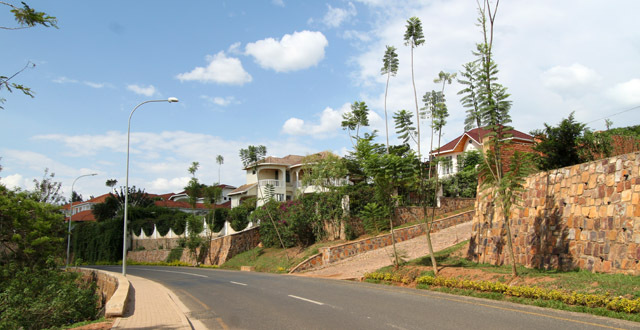 It’s commonly also referred to as Kimihurura but it’s actually a whole different neighbourhood. The top of Rugando is bordered by KN5 Road which is the busy main road at the top of the hill. As you move away from the road, the hill gets very steep and goes into a big valley where many of the houses are. The area is quite nice and leafy and most of the roads are cobblestone which adds a certain charm. Roads here are hit and miss with some being perfectly paved and others not actually much more than a narrow dirt foot path with a treacherous bridge or two. I once had a mightily adventurous moto ride in this neighbourhood while I was working on my Kigali map that I’d prefer never to repeat. A few offices and NGOs are located in Rugando including Care, Save the Children, IOM, and one of the GIZ offices. If you work at any of these places then this neighbourhood would be handy for walking. It’s hilly, though! I’ve been to parties at a couple of shared houses in this area that were huge with giant balconies on the second floor. I’m not sure if that’s an indication of all the houses in this area, but if you’re looking for a big place at a good price, this area could be a good choice for your. Rugando is mostly a residential neighbourhood but Lemigo Hotel has a swimming pool (that’s good for both lounging and laps) and they also have a decent gym. Grazia Apartments also has a small pool if you’re looking for a place to lounge. Simba Supermarket has a branch here just at the top of the hill. It’s weirdly stocked with a strange focus on toys and cleaning supplies. For a better selection, wander down the road a bit to the branch at Kigali Heights. There are a couple of very small shops in among the houses but they’re not good for much more than the basics. Alink Chinese – This place has been in Kigali for years. It’s one of the strangest places I’ve been but also one of the best sports for Chinese. Except that one time they ran out of rice. Great Wall – I used to love Great Wall when it was over in Kacyiru in a super dodgy building (with a lot of charm). It’s moved to Rugando and the building isn’t quite as quirky but the food is just as good as always. The Hut – The Hut is one of my favourite restaurants in Kigali. The menu is interesting and it’s one of the best places to come for grilled meat. It has a beautiful view and there’s even a small swimming pool. Habesha – This Ethiopian restaurant seems to have taken over from Lalibela as many people’s top choice in Kigali. It’s great for groups and very affordable, too, especially if you get the meat or veg platters. Inka Steakhouse – This place is tucked way at the bottom of Rugando in a beautiful space. They seem to have put a lot into the design and the outdoor fire pit is a nice touch. This place is great for steak and also a good date spot. Simba – Simba is known mainly as a supermarket but the branch in town and the one in Ruganda both have cafes attached. This is one of the best places for a good value meal with huge portions for cheap. This branch is also a fun place for drinks in the evening. Casino Kigali is located inside Lemigo Hotel and it’s actually pretty fun with a group of friends. I found your website a few weeks ago and I’ve been pining through it because my family and I are moving to Kigali on July 4th. We’re missionaries and I’ll be doing some mission work as my wife works in/with health care as a consultant (she’s a speech pathologist). We’re actually going to be living in Rugando and this little article is very encouraging. I’ve been looking hard to find as much information as I can about how cell phones and home internet work these days, but everything I’m finding on your site is from 2011 and 2012. I was wondering if you might be willing to give me some insight, either here or with an updated article. Your writing is highly informative and entertaining and the information is invaluable! Thanks in advance!